2010 sets from Upper Deck don't have a license from MLB Properties, so (supposedly) aren't allowed to display team names or logos. They're now dealing with a lawsuit from Major League Baseball and it might boil down to whether or not printing a picture of a player wearing a logo is the same as reproducing the logo itself. Of course, plenty of companies licensed the right to show player pictures in the past without getting MLB permission to show uniforms. This Nestle card's one example. 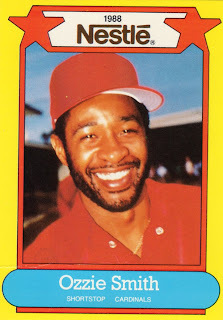 While a great close-up of Ozzie Smith, Nestle calls the team "Cardinals" and airbrushed everything to solid red, as if The Wizard actually plays for a weekend softball team. Upper Deck could've gone this route (by photo-editing each card) and clearly chose not to do so. I doubt that a 700-card set of bland pictures would sell well, so wonder--did they have much of an alternative? the 80's and early 90's were loaded with these oddball sets licensed by the mlbpa and for the most part they look decent. i actually love collecting them! There's a lot to like about these sets, but they were never a personal fave of mine. Mostly because of the weekend beer league softball feel you pointed out---it looks like OZ is wearing a mesh trucker hat. Drizz, I've got a bunch of extras from that era. Want me to send you any Tigers I find?